The New Zealand Department of Conservation has closed off a beach where hundreds of pilot whales are stranded amid fears the rotting carcasses could “explode” on volunteers helping with the clean up operation. While attempts to clean up the several hundred dead whales that have washed up on a narrow sand spit in Golden Bay since Thursday, Mike Ogle, DOC’s operations manager, has described the carcasses as "just nasty" while also warning people to keep their distance. "These things explode from the stomach and if you're standing right there it's not very nice getting a 'gut bomb' on your face,” Ogle said, adding that arrangements to clear the beach of the unfortunate sea creatures will be made on Monday. "We will combine all the methods in the past to dispose of them, and that involves dragging them using trucks and dumping some in the dunes and leaving others in the waves to wash over them." Described by Project Jonah, a New Zealand animal rights NGO, as “one of the worst [strandings] in NZ history,” some 416 whales washed up on the shore earlier this week, the majority of which perished despite help from hundreds of volunteers. Another 200 whales became stranded near the original site on Friday prompting the DOC and Project Jonah to call for even more volunteers. 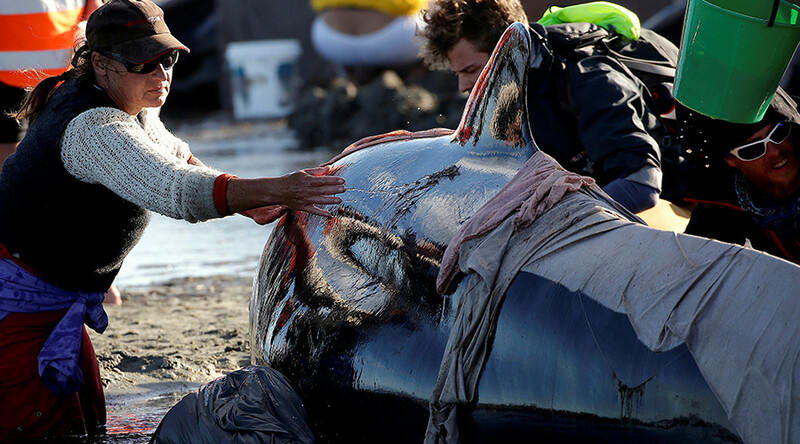 Dedicated animal lovers saved 100 of the whales but matters were complicated Sunday when a further 18 washed up on another beach, less than a kilometer away. All but two have since rejoined their pod of some 200 whales swimming close to the shore. Farewell Spit is notorious for being a trap for the mammals. In February 2015, about 190 whales were stranded on the beach there. There are several hypotheses for the mass strandings. Some scientists think geomagnetic anomalies may be causing navigation errors, while others believe the whales may be following sick or younger members of the group onto the shore.